At 7:40 p.m. on May 21, 1942, 2nd Lt. George D. Hobbs was returning to Bridgeport Airport after an interception mission when he discovered that the landing gear on his P-36C airplane (Ser. No. 38-204) wouldn’t come down using the electric switch, so he was forced to bring the wheels down manually. He then discovered that the flaps weren’t working either. After trying to work them manually, he came in for a landing, but the brakes failed after touchdown, and the aircraft continued on into a dyke at the end of the runway. Although the aircraft suffered damage, Lt. Hobbs was not injured. Lt. Hobbs was assigned to the 61st Pursuit Squadron (I) based in Bridgeport, Ct. 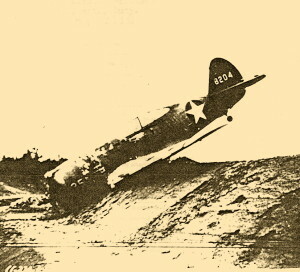 Source: U.S. Army Air Corps Technical Report Of Aircraft Accident #42-5-21-28. Photo of aircraft is from the report.